The VERSACE is the latest edition to our Smooth Decadence range and is the only door of its kind on the market. The door is set in one of our unique arched frames and set off centre. 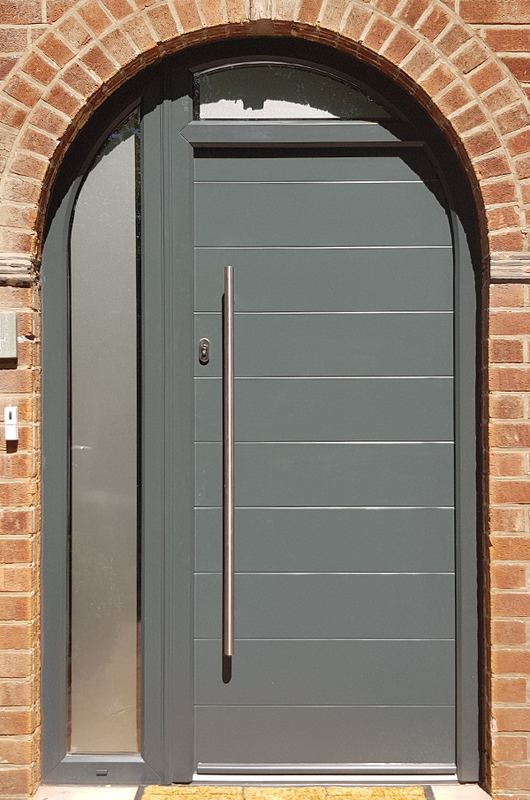 The top corner of the door is shaped to match the arch, there is no other company in the UK today that can provide this type of door, frame or service. The edge to edge groove detail is a completely new design and can only be found on the VERSACE, adding the latest Force 8 stainless steel hardware range finishes the cutting edge look of this door. The Decadence door range is now PAS24 Security Tested and approved and Document Q Compliant. • Locking system: The Surefire lock security system now features on the door. This locking system features high security hooks which have anti drill and anti-saw protection. It also features a high-quality latch design ensuring that it can’t misalign when being fitted onto the door. Lock allows for smooth operation with the use of 2 hooks, preventing the door from bowing. • Colours: available in 210 RAL colours. • Has a 10-year guarantee. The VERSACE is part of the Decadence Smooth door range; the Smooth finish has the look of a more expensive aluminium door, but with all the thermal benefits of a composite door, and no heavy price tag. If you were to purchase this door in Aluminium in a single colour you would be looking at around five times the amount. The VERSACE is manufactured here in our Stockport factory giving us complete control over the finish and quality control, all our doors are made to measure. The VERSACE is set to revolutionize the door market, join the revolution contact Force 8 today to get the full details.